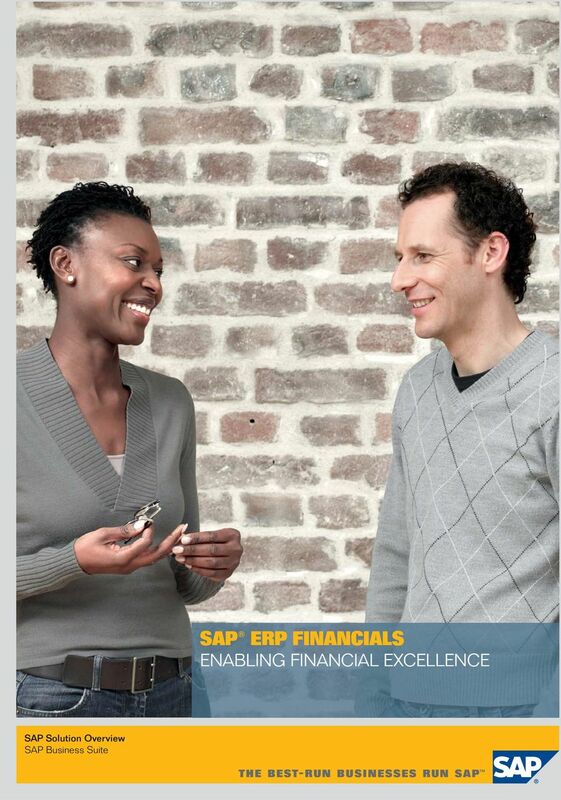 Download "SAP ERP FINANCIALS ENABLING FINANCIAL EXCELLENCE. 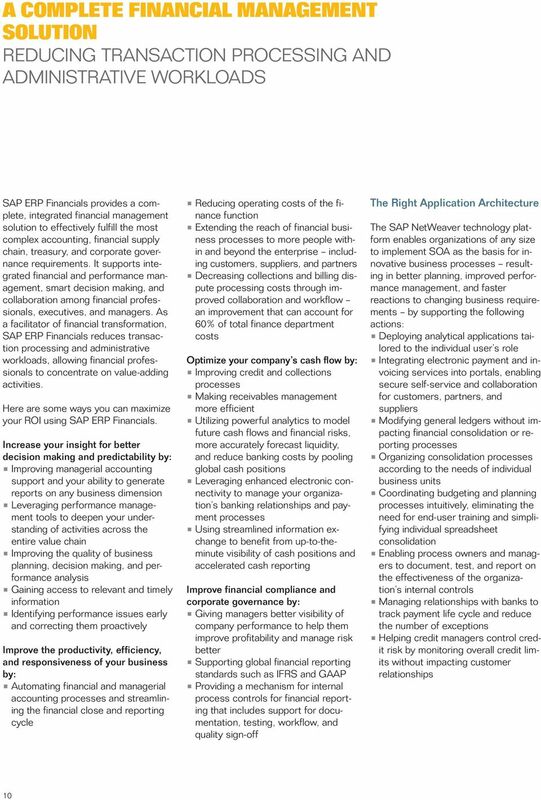 SAP Solution Overview SAP Business Suite"
6 FOCUSED FINANCIAL MANAGEMENT GAINING INDUSTRY-SPECIFIC SUPPORT FOR CORE ACCOUNTING From the knowledge gained from thousands of successful customer implementations, SAP has enhanced SAP ERP Financials with functionality supporting best-practices for the financial management requirements of companies in more than 25 industries. 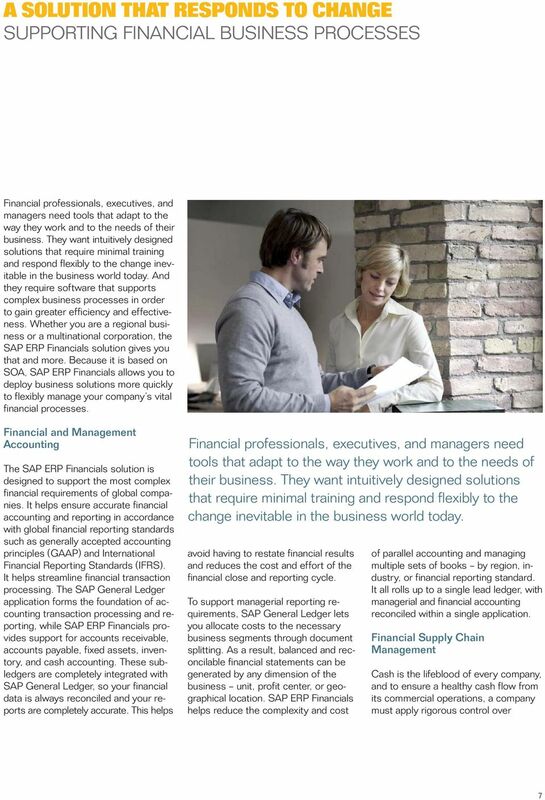 This delivers to you best-in-class support for your industry-specific core accounting and financial reporting processes. But the software s reach is much broader. 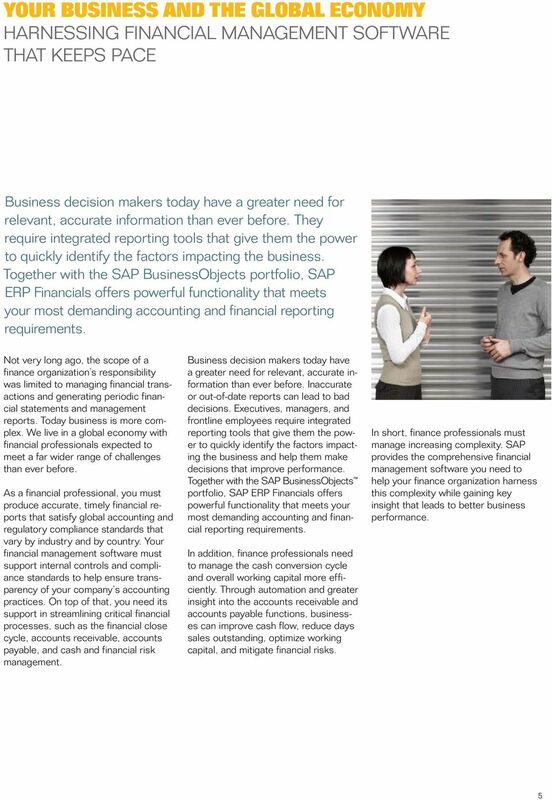 It gives you the ability to collaborate across organizational boundaries on a single platform that brings unprecedented efficiency to your financial processes through end-to-end process integrity. 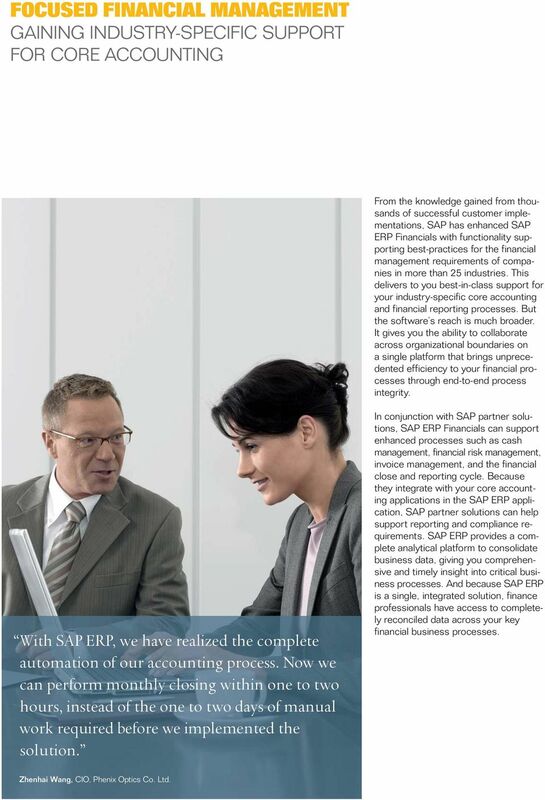 With SAP ERP, we have realized the complete automation of our accounting process. Now we can perform monthly closing within one to two hours, instead of the one to two days of manual work required before we implemented the solution. 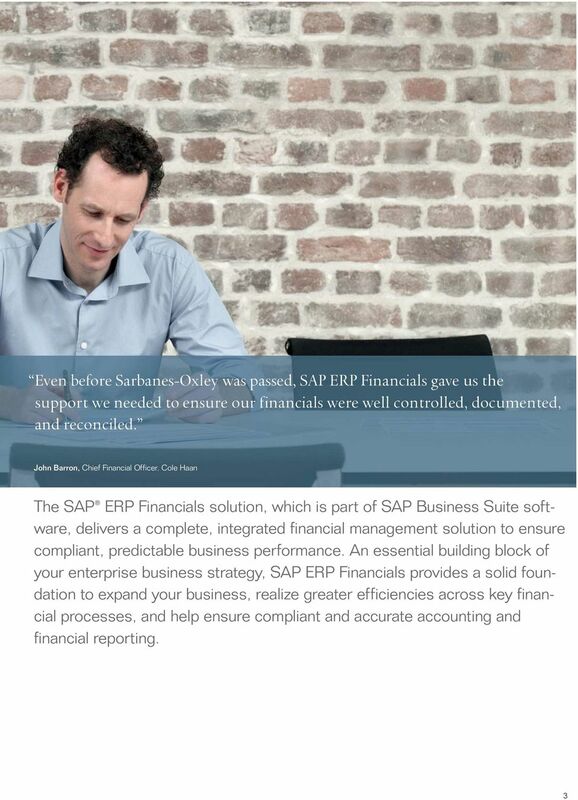 In conjunction with SAP partner solutions, SAP ERP Financials can support enhanced processes such as cash management, financial risk management, invoice management, and the financial close and reporting cycle. 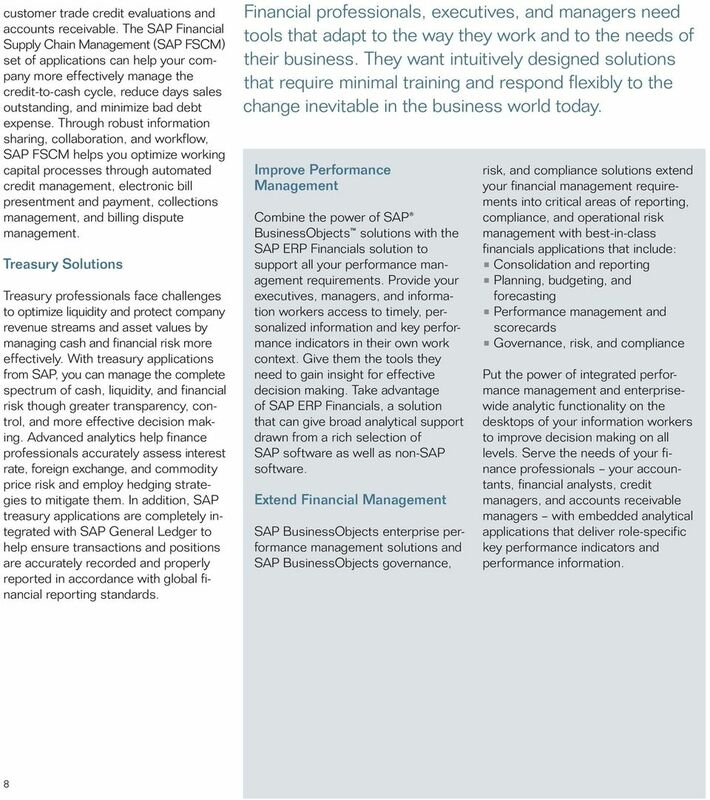 Because they integrate with your core accounting applications in the SAP ERP application, SAP partner solutions can help support reporting and compliance requirements. 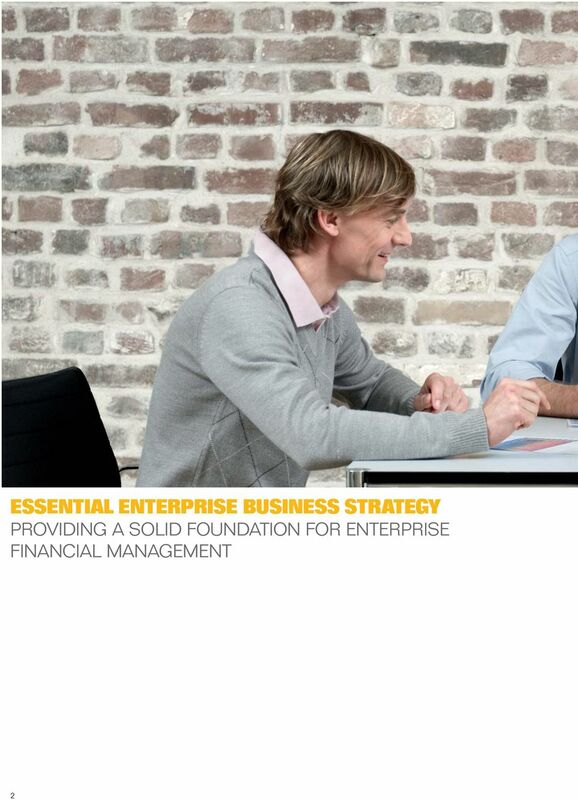 SAP ERP provides a complete analytical platform to consolidate business data, giving you comprehensive and timely insight into critical business processes. 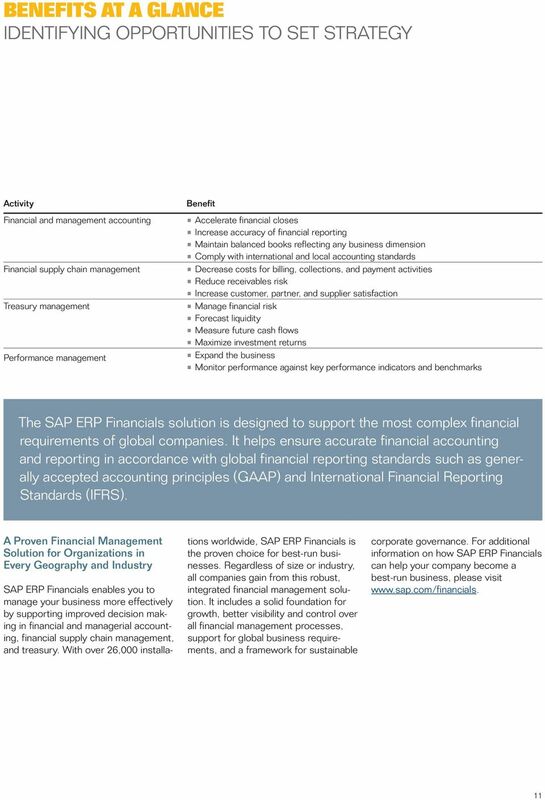 And because SAP ERP is a single, integrated solution, finance professionals have access to completely reconciled data across your key financial business processes. Zhenhai Wang, CIO, Phenix Optics Co. Ltd.
12 (09/04) 2009 by SAP AG. All rights reserved. 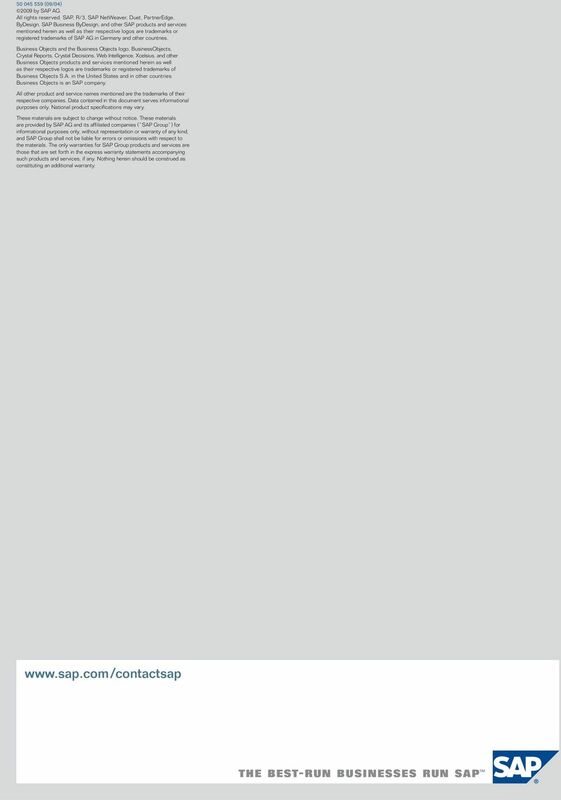 SAP, R/3, SAP NetWeaver, Duet, PartnerEdge, ByDesign, SAP Business ByDesign, and other SAP products and services mentioned herein as well as their respective logos are trademarks or registered trademarks of SAP AG in Germany and other countries. Business Objects and the Business Objects logo, BusinessObjects, Crystal Reports, Crystal Decisions, Web Intelligence, Xcelsius, and other Business Objects products and services mentioned herein as well as their respective logos are trademarks or registered trademarks of Business Objects S.A. in the United States and in other countries. 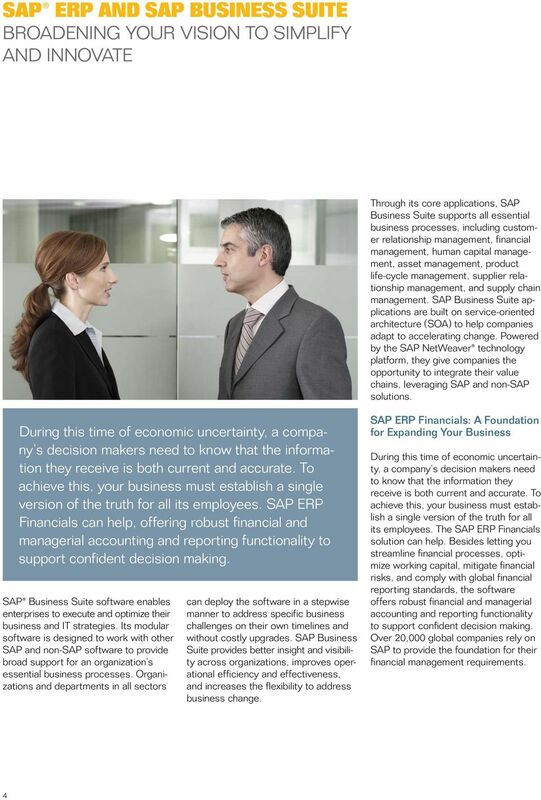 Business Objects is an SAP company. All other product and service names mentioned are the trademarks of their respective companies. Data contained in this document serves informational purposes only. National product specifi cations may vary. These materials are subject to change without notice. These materials are provided by SAP AG and its affiliated companies ( SAP Group ) for informational purposes only, without representation or warranty of any kind, and SAP Group shall not be liable for errors or omissions with respect to the materials. 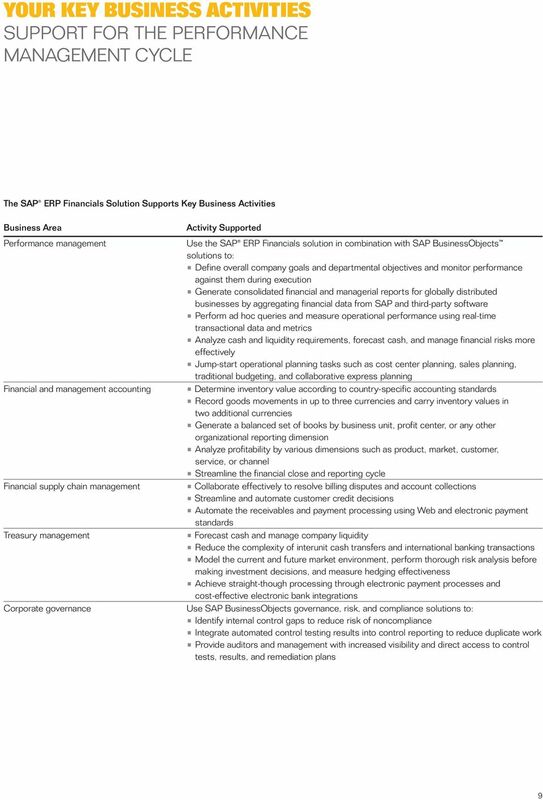 The only warranties for SAP Group products and services are those that are set forth in the express warranty statements accompanying such products and services, if any. Nothing herein should be construed as constituting an additional warranty. I N D U S T R Y INTELLIGENCE AND HOMELAND DEFENSE INSIGHT INTELLIGENCE AND HOMELAND DEFENSE CHALLENGES The Intelligence Community (IC) needs the right information, in real time, to make critical decisions.